One of my least favorite things about being a cat owner is the litter box. While it’s nice not having to walk your cat for them to “take care of business”, dealing with a litter box still isn’t fun. It’s dusty, dirty, smelly, and you’d better hope the cats don’t tear the litter box liner while they’re scratching around. Beyond the box, finding the right litter can be a challenge as well. I tried natural litters, scented litters, unscented litters, clumping litters, flushable litters. Then once I found the right litter, I would time my litter purchased around store sales. It wasn’t uncommon for me to grab 2 or 3 big boxes of litter at a time. And you know what? Litter boxes are heavy. 2-3 boxes of litter are even heavier. Tidy Cats has just introduced a new kitty litter that helps solve all of the problems that come with litter boxes. No, it’s not a robot that will change the litter for you (although that would be awesome.) It’s their new Tidy Cats Lightweight 24/7 Performance Litter. 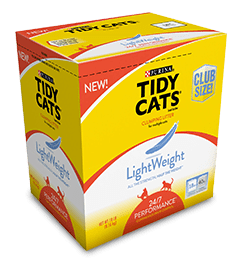 Tidy Cats® Lightweight 24/7 Performance® Litter locks in moisture, has a powerful odor control strong clumps for easy clean up and the best part: the container is lightweight! Not only does Tidy Cats® Lightweight 24/7 Performance® Litter have the same odor-fighting strength we’ve come to expect, but it’s also 99.9% dust-free and is half the weight of traditional scooping litter. That means no more heaving a heavy box while pouring out the new litter. That means no more dragging the litter container across the floor because it’s too heavy. A Tidy Cats® Lightweight 24/7 Performance® Litter 18 lb litter container is the equivalent to a 40 lb box of the leading scoop litter. 18 lbs vs. 40 lbs. Which would you rather carry home from the store? What’s your least favorite part of cleaning the litter box? I think this is a good idea to have a lightweight formula of cat litter to carry home from the store. I’d like to let my cat try it. I have got to look for this! I do not drive so that makes it even harder to buy cat litter. Carrying it home, the way I do with most of my groceries is not an option, same with taking it on the bus, because I still live a few blocks from the closest bus stop. I would be able to carry this in my little cart that I use for shopping. Yay Tidy Cat!! I have heard good things and bad things about this. I would love to give it a try to see if it would work for me and my 4 cats! Linda Bradshaw , teachinmomma123abc at yahoo dot com.